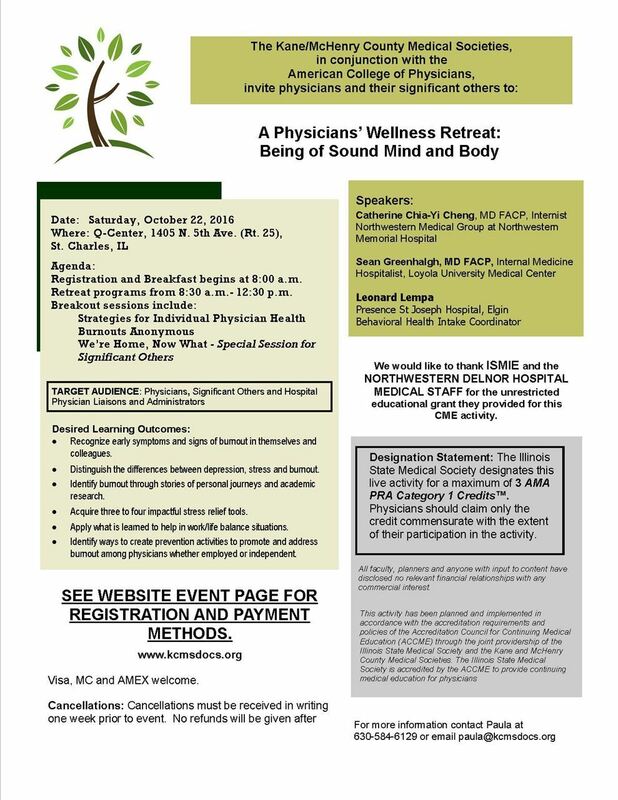 Kane County Medical Society - Physicians Wellness Retreat "Being of Sound Mind and Body"
Physicians Wellness Retreat "Being of Sound Mind and Body"
Cost for any county member in the Kane, McHenry, DuPage, Lake, Will-Grundy, Winnebago or Chicago County Medical Societies. Cost for Hospital Administrator or a Sponsoring Hospital Medical Staff Physician. Cost of a Non-Member Physician who is not a medical staff employee with a sponsoring hospital. Cost for a Non-Member Significant Other (physician is not a member of the county society or on a medical staff of a sponsoring hospital). Resident in a formal residency program in IL. Cost for Significant Other associated with a County Medical Society Member. Medical Student that received a free voucher through school.